The Arizona landscape is admired for its wide open skies and sprawling desert vistas. Considering that it is common for homes in Arizona to have flat roofs, many homeowners choose to construct decks on their roofs that will allow them to enjoy unobstructed views of the surrounding scenery. Of course, however, safety must be a primary consideration in designing these decks. Choosing the right railing for a view deck is the key to ensuring safety without distracting from the beautiful vistas. 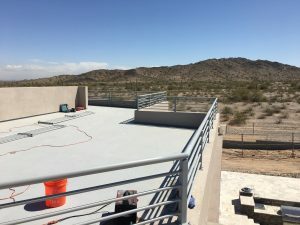 DCS Industries recently worked with homeowners in Goodyear who were building a deck on the roof of their home from which they could enjoy views of the surrounding mountains. Our team of professionals installed a wrought iron railing to safely enclose the view deck. With a sleek, silvery gray hue, the railing has a modern aesthetic that complements the home’s style and exterior paint color. In addition, the railing’s simplicity and wide gaps between its horizontal bars allow for untainted views of the surrounding scenery. Whether used in view deck railings, perimeter fences, or decorative gates, wrought iron is an elegant addition to any property. But its benefits extend far beyond its aesthetic appeal—wrought iron is naturally very durable, making it safer and longer-lasting than other materials. Therefore, wrought iron is a particularly great choice for the outdoors because it is able to withstand intense heat, sunshine, rain, and other threats that would quickly cause deterioration in less sturdy materials. When used in barriers that are essential for keeping people safe—such as view deck railings—wrought iron’s durability ensures that it will not be bent, broken, or otherwise breached. At DCS Industries, all of our wrought iron products are made from premium-grade steel and carry the option of galvanization, which refers to the process of sealing the wrought iron with a protective zinc coating, for long-lasting reliability. 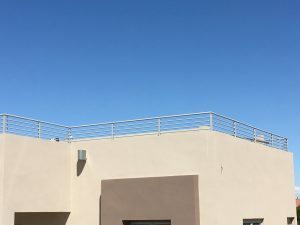 With its sleek appearance and natural strength, the view deck railing installed by DCS Industries is sure to fulfill the homeowners’ goals of creating a safe and beautiful space from which to enjoy the stunning desert landscape surrounding their home. Thinking of installing a view deck at your home? Call DCS Industries today at 623-825-7700 or request a free estimate on a wrought iron railing or our many other high-quality wrought iron products!